This year we are delighted to see the highest ever value added score for all groups of students. In particular, Mathematics saw their best ever results with a stunning 86% of students gaining C grade or above. Highlighting our progress across the board, 16 other subjects, showed percentage success rates exceeding 80%. There have been massive improvements in MFL where, over the three languages taught, over 95% of the boys gained a pass, 33% of these at grade A/A*. English Literature results remain excellent at 84% A*-C, with English Language at 70% A*-C.
Our thanks go to the students, staff, parents and governors for all their support and hard work. We are pleased to have another set of very good A Level results. Both girls and boys have performed very well. 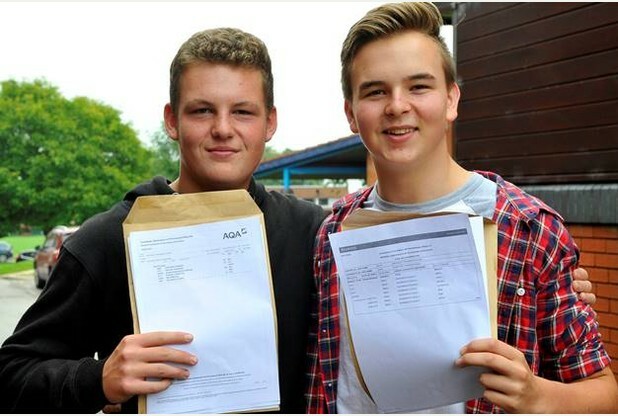 The pass rate is 99% with almost half of grades awarded being at A*-B. In addition students who have pursued vocational qualifications have achieved highly. There have been some superb individual results with Oliver Hulme achieving 4 A* grades and Alex Borthwick and Sam Burton achieving 4 A grades. 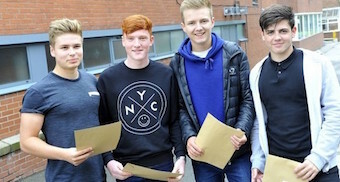 A further 3 students, Callum Blake, Toby Brown and Hannah Waters achieved 3 A or A* grades. We again have a successful Oxbridge entrant with Oliver Hulme reading Natural Sciences at Cambridge University. A number of students will also be studying medicine or dentistry at their chosen universities.